I met a woman in a campground last summer and I really wanted to keep in touch with her. The feeling was mutual and we both wrote down our email addresses on slips of paper and exchanged them. 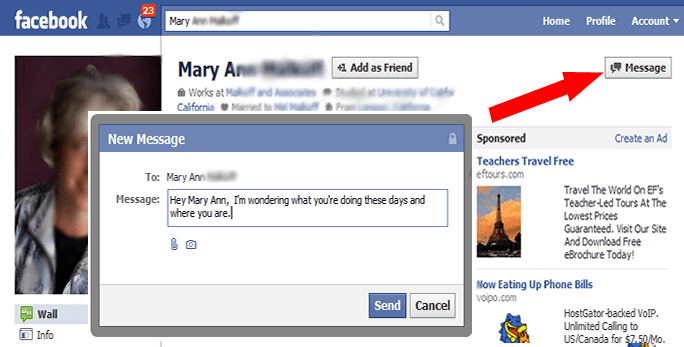 You do need to be a Facebook member in order to send a message. If you’re not a member now, you will have the opportunity to sign up after you click ‘Message.’ It’s free, and the only information you need to supply are your name, email, gender, and date of birth. Don’t worry, you can specify that these items not be shared, all except your name that is. Published by MrsGeek, in Blog. Tagged with Email without addresses, Facebook Messages.